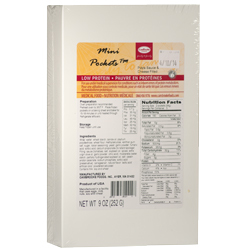 Description: Each package contains 6 - 42 g Italian seasoned Mini Pockets that are bursting with sauce, cheese and pizza taste. Quick from package to the table, just heat and serve for a delicious snack or tasty meal. Preparation: Oven preparation recommended. Preheat oven to 350º F. Place frozen Mini Pockets on a baking sheet and bake for 15-18 minutes or to heat through. Serving Suggestions: Serve with marinara sauce sauce for dipping. Ingredients: Wrap: water, wheat starch, canola oil, psyllium, polydextrose, wheat flour, methylcellulose, xanthan gum, salt, sugar, italian seasoning, yeast, garlic powder, fumaric acid, sorbic acid, calcium propionate (to retard spoilage). Filling: sauce (tomatoes, salt, soybean oil, spices, extra virgin olive oil, garlic powder, citric acid), mozzarella (water, food starch, partially hydrogenated soybean oil, whey, salt, casein and/or caseinate, sodium phosphate, sorbic acid [preservative], carrageenan, natural flavor, lactic acid, artificial color, [food starch, powdered cellulose, dextrose, glucose oxidase, added to prevent caking and to maintain freshness]). Contains milk, soy and wheat.